Since Apple dropped MagSafe in favor of USB-C, one of the big positives was the ability for third-party manufacturers to create external batteries and chargers. There have been a few until now, but recently we’ve seen several hit the market. Notable entrants from Aukey, RAVPower, Anker, and now Mophie. Mophie has just released an updated version of their Powerstation XXL, cleverly named Powerstation USB-C XXL. It doesn’t differ greatly from the other batteries we’ve seen in the past, but it is possibly the most well known. The battery comes equipped with a 19,500mAh capacity. While surely still impressive, it is lower than Aukey, Anker, and RAVPower where they clocked in at 30,000, 26,800, and 26,800 mAh respectively. There are 2 ports located on of the end caps of the Mophie. A USB-C and a USB-A port. the USB-A port is a standard USB port. You can use for charging any number of USB peripherals. The USB-C port on the other hand, is a dual-use port. You can use it to charge your devices, such as a MacBook, Nintendo Switch, or your iPad Pro (with a lightning to USB-C cable). Or you can use it to charge the battery itself. A pair of cables are included (USB-C to USB-A and USB-C to USB-C) that you can use to charge the battery, but no wall power adapter. For that, you will have to use your own. I’ve used the 13W brick from my iPad, as well as the one from my MacBook to fill up the Mophie. One of the most unique features of the battery pack is the fabric it’s wrapped in. Other batteries are usually one of two materials. Full on plastic, or anodized aluminum. The plastic options always seemed to feel on the cheap side to me. The metal on the other hand, while more premium, is heavier and makes me nervous of damage coming to anything else in the bag. The last thing I want is a large gash in my MacBook because it came in contact with the battery pack. The Mophie opted for a very premium fabric to go around the exterior. It felt a lot better in person than I expected. It gives it almost a warm feeling, and has a slight tackiness to the battery that makes it easier to hold on to. It also washes away any worries of my gear getting damaged in transit. While this monster of a battery will do a fine job powering up your phones or tablets, the big draw for me was the ability to charge your MacBook. 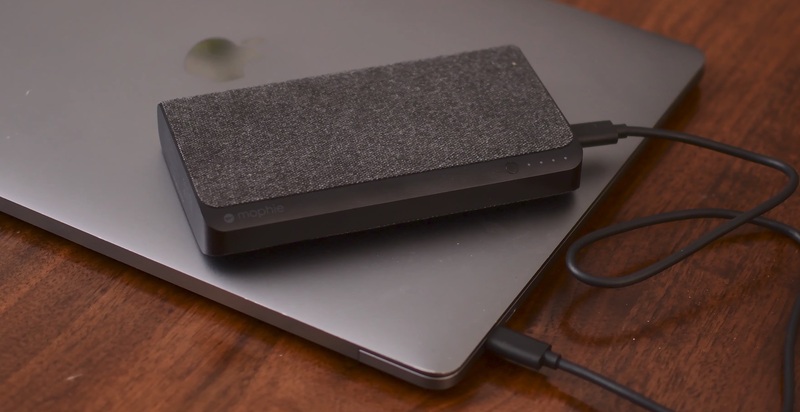 Mophie says you can get up to 14 additional hours on your MacBook. However, you need to remember that is off the standard MacBook. Not a MacBook Pro. On the Pro, you can expect to see 3-4 additional hours of battery life, on top of what your laptops internal battery can provide. I’m a bit hard on my laptop. Working with photos and videos. So I see a bit higher battery consumption than most users, but I was still able to secure a few extra hours out of my machine that I wouldn’t get before. My battery has always been pretty solid on the new Pro, so getting those extra hours was very useful. The output from this battery is capable of 30 watts. Notably lower than the output from the actual power adapter on the MacBook Pro that is a beefy 87 watts. That just means it will charge a bit slower than your actual power adapter. If you are also doing any intensive work on your machine you may also see your battery life stay the same. Effectively, you are using your battery at the same rate you are charging it. You are still getting extra battery time, but the battery remaining isn’t increasing. Personally, if I am out for a while, I will start with a full laptop and full battery pack. I will plug the battery in right away, and use it until the battery pack dies, and I still have a full laptop battery. Then I can put the battery away and just rely on the built in battery for the rest of the day/weekend. Pro tip! 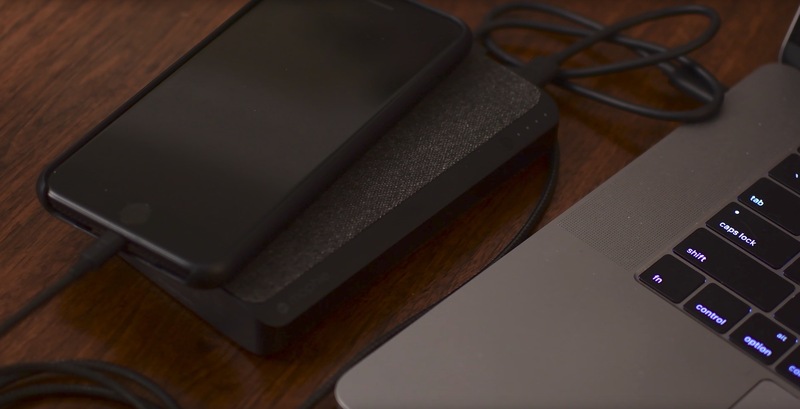 You can actually charge your Mophie Powerstation from your MacBook as well. Normally, if you plug the battery into your laptop, it will just.. try to charge the laptop. If you have your MacBook’s power adapter though, you may want to charge your laptop, and the battery at the same time. To do this, simply plug it in, then hold the button for 2 seconds. This will reverse the flow, and power the battery, instead of the battery trying to power your laptop. Now you can charge both at once! For me, this is clearly the most handsome of the USC-C Power Delivery battery packs. I love the fabric, and I don’t have to put it in a bag, or worry about it damaging my other devices. I also like that it has a dual purpose port. Instead of having to rely on one port for input, and another for output. That just gets confusing to use and keep the straight. However, on the downside, at $149 it is the most expensive one we’ve seen, without having the largest capacity. The price could more easily be justified if it had a higher capacity, but that isn’t the case. Always the one to play devil’s advocate however, the size is much more manageable, and something I can comfortably slip in a back pocket and not have to worry about. If I’d tried that with the Anker, the battery would have never let my pants stay up. Just far too large and heavy. 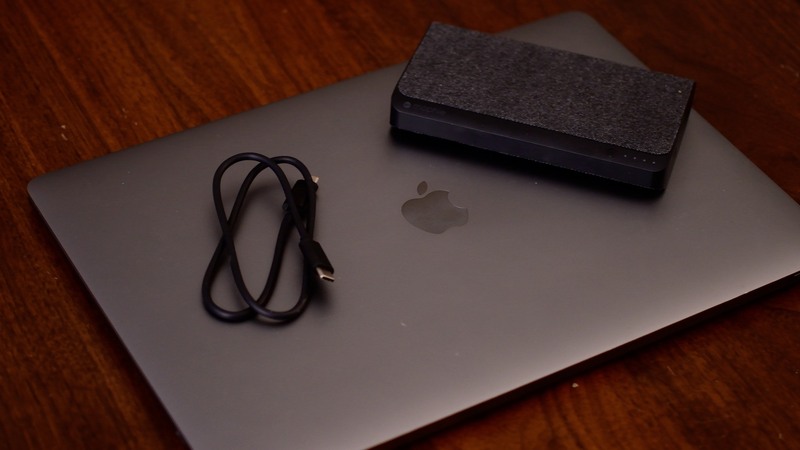 If you have a MacBook or MacBook Pro, I highly recommend picking up a battery pack. They are extremely handy and a wonderful upside to losing our beloved MagSafe. You have several options to choose from, but if you are looking for the most attractive option that is a comfortable size to carry around, the Mophie is your best bet. Currently, it is an Apple Store exclusive which means you can buy online, or easily stop by your local store to snag one.